Invite the guidance of the angel who embodies the courage, justice, and devotion to truth. 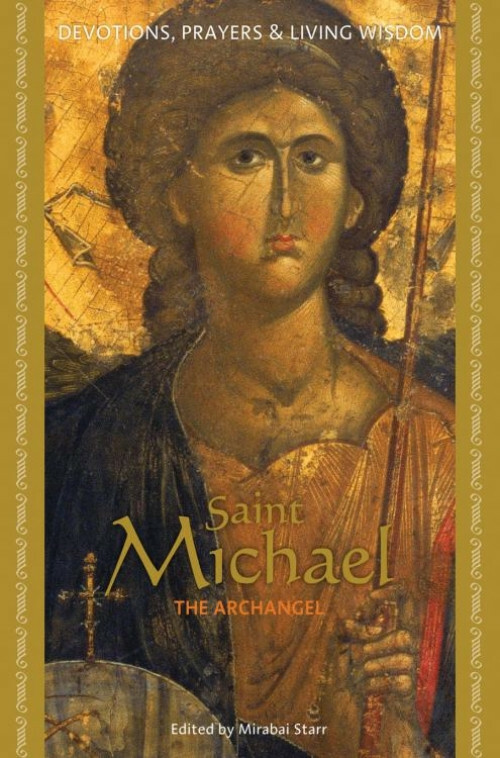 Who is the Archangel Michael? Never unkind, but not always gentle, he embodies the essence of the "spiritual warrior"—courageous and strong in the face of injustice or illusion, a ceaseless devotee of truth. Saint Michael offers you the hand of this protective force through a collection of prayers, scripture, contemplations, and stories that span the ages and traditions in which this legendary figure has appeared. The name Michael means "who is like God." By invoking Michael's power, we invite into our own lives the divine energy to lift us past obstacles. Saint Michael gives you a devotional treasure for calling on this archangel for protection in times of danger, for strength in taking action for the greater good, for compassion in defense of the innocent, and for grace as we embark on the journey that awaits at the end of our lives. I bought this book, probably when it came out, from I can't even remember which bookstore. I had no idea who Mirabai Starr was and probably didn't even look at who wrote what or did what. I just loved the size of the book and I like Michael. I suspect it might even have been on a sale. I read it immediately because it was so small and I was so surprised at the character of the book. I think I probably expected a typical lesson on Michael and instead I got Mirabai Starr's lesson. This book lead me to read more books by her and I've yet to be disappointed. This is a sweet little book and I wish there was a whole series of books just like this one on more of the saints.